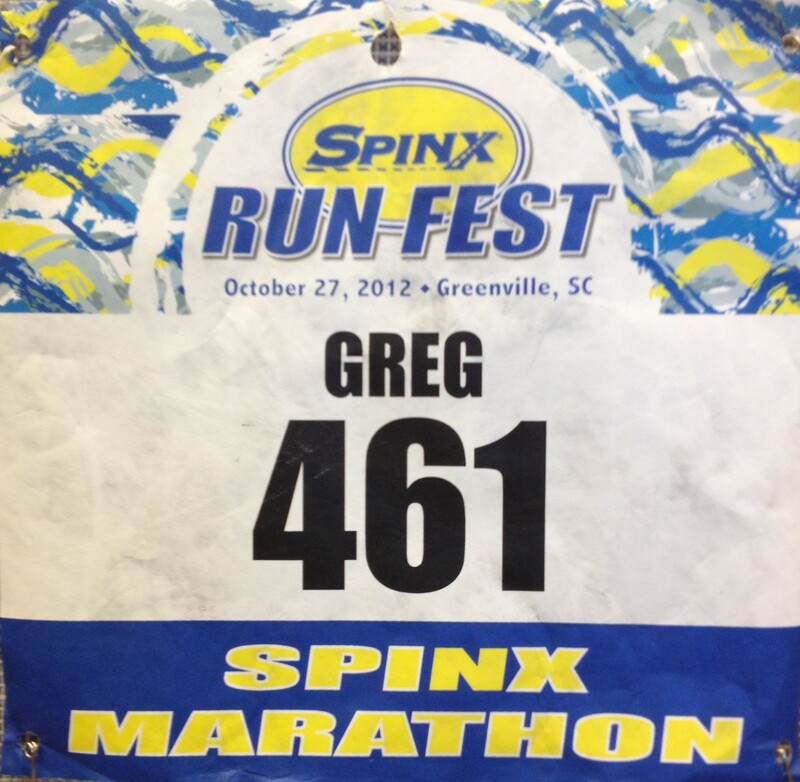 This is part one of my write up on the Spinx Run Fest Marathon in Greenville, South Carolina. In this part, I’ll cover pre race. 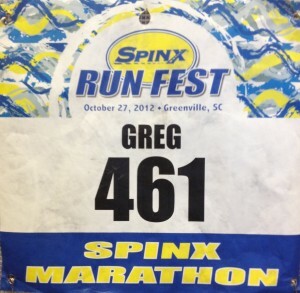 Three weeks ago, I considered not going to the Spinx Run Fest (SRF) marathon. My last couple of scheduled long training runs before race day had not gone well, and I was doubting my fitness. Since I had paid the early registration, I figured it wouldn’t be the first time I’d wasted $50. Well, a turn in the weather and a decent 12K race two weeks prior changed my mind. I am so glad I did. 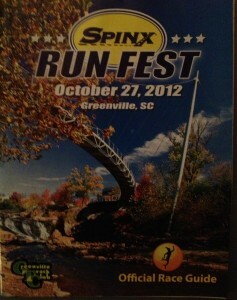 The SRF was definitely worth the two hour drive to Greenville. Short Version: I really enjoyed my SRF experience. I thought the course was excellent, especially the Swamp Rabbit Trail. Finishing in the stadium is a nice touch. If you are from out of town and can make a weekend of it and stay at one of the downtown hotels, I think you will really enjoy Greenville. For the race results click here. As you probably know, most marathons have an Expo the day before the race, where vendors and other race promoters gather to sell and advertise to the runners. From what I could gather from articles about Run Fest, last year’s Expo was held outside at Fluor Field and the weather was iffy. This year’s Expo and packet pickup was moved to the nearby Kroc Center, but vendor participation seemed small to me. I did appreciate the candy corn handout from Pace Magazine. A small bit of carb loading! I also found a sweet orange Saucony jacket at one vendor’s tent that almost made the trip back with me, but I refrained. The packet pickup went smoothly, and I headed out to scope out parking near the race start. The main thing I care about for a race is the shirt. 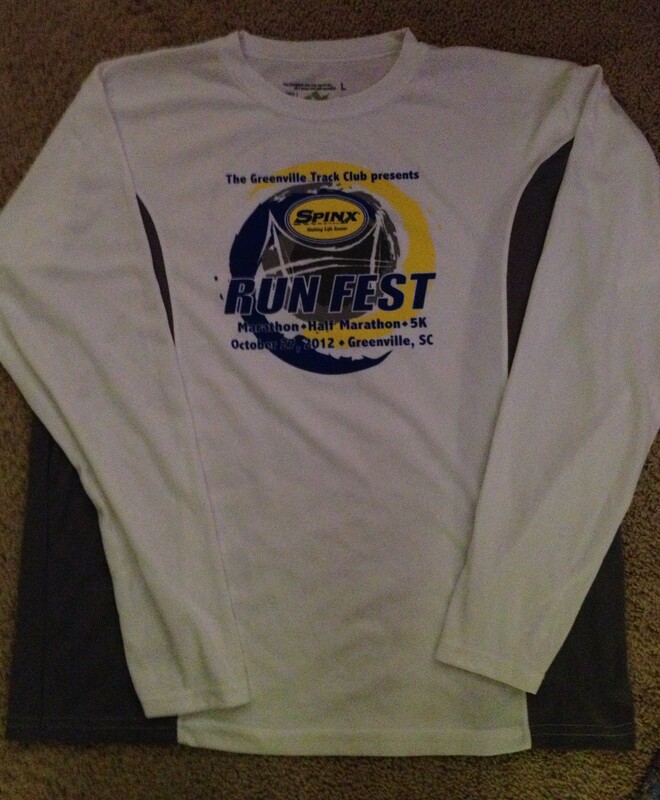 The SRF did a great job on the shirt. It is a two tone white and gray long sleeve technical shirt. Seems to be better quality than some of the long sleeve tech shirts I’ve received from other races. And it fits well. Several of the poorer quality shirts didn’t fit well, and when I tried to trade for another size, they didn’t have that option. SRF had that option on race day, but I didn’t need it. As a swag bonus, the marathoners received a pair of socks with the race logo. One very nice surprise in the race packet was the official race magazine. It had course maps (there were 3 other races in the SRF – a half marathon, a 5K and a kid’s fun run) and additional detail of complicated spots like Furman University. I found it very helpful to study the night before. I left the Expo area with map in hand and drove the first 2 miles of the course. Just after mile 2, the course hits the Swamp Rabbit Trail and cars are not allowed! I briefly entertained driving out to Furman to scope out that section, but since it was in the opposite direction of my Friday night lodging, I decided against it. Trying to keep the expenses for this marathon as low as possible, I bummed a room off father-in-law for the night. I arrived at his house, ate dinner, and studied the course map. I pondered my target pace for a while, made the decision, and then went to bed early.